Ultra Responsive MyUniversity will fit your large desktop screen, all the way down to your iPhone and of course any Tablet or iPad. 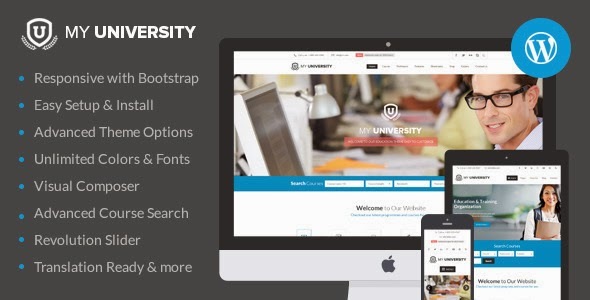 Extended Documentation – MyUniversity is super easy to install and setup and comes with an extended documentation, ready to use page layouts and examples, HD video tutorials, PSD designs and much more. Lifetime Support & Updates – Buy any theme now and enjoy free, premium, lifetime support. Item Reviewed: My University New Education College WordPress Theme 9 out of 10 based on 10 ratings. 9 user reviews.